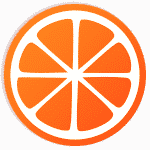 We’re back again with our weekend round up! As Lauren said last week, we love comparing notes on what we did over the weekend – although if we’re being honest, we’re usually in touch fri through sun too. So here is this weekend’s experimentation. Carolyn: I made up for my lack of cooking last weekend, up in a Catskills air b n b with 7 friends. 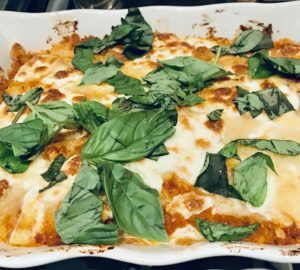 Pasta was requested by the bday boy so I whipped up 3 variations of ziti; grass fed bolognese, gluten free (banza) for me, and a vegetarian version. I try not to force my eating habits on my friends but I have to say they loved that we had “breakfast salad” every morning… followed by breakfast tacos. 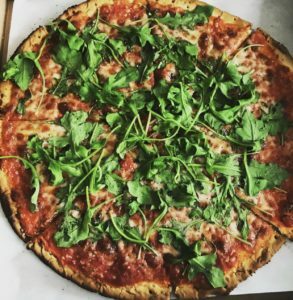 Lauren: The most “worth it” treat ever: gluten free Arugula Pizza. 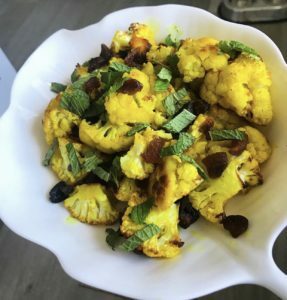 I also recreated this Turmeric Cauliflower with cacao nibs, mint and apricots. I saw it on Insta (@denisemari) and had to try cacao with cauli. I didn’t have a recipe but will write up what I did for you. Carolyn: Tiny Beautiful Things: Advice on Love and Life from Dear Sugar by Cheryl Strayed. I have a thing for short stories right now, love dipping in and out or opening to a random one. This is the second time this landed in my hands and I’m loving all of Cheryl’s wisdom. Lauren: I started Medical Medium’s new book Liver Rescue. I like his work, though we differ on specifics of diet composition. I also read White Darkness and this article that Eleven Madison Park is banning cell phones and giving little wooden boxes to put them in, guess they don’t care about Insta. Carolyn: I didn’t watch a damn thing on technology and it felt SO good. Lots of board games and trivia and chasing dogs down instead. Lauren: What does it say about me that I binge watched Women in Prison? Moving on, also watched the Parts Unknown episode where producers reflect back on working with Bordain, it’s heartbreaking. Interestingly, I don’t seem to get through Bordain’s books. Onto this week! What did you cook/read/watch this weekend? Anything we missed?